Good morning and welcome to Bangkok and welcome to the United Nations Conference Center and UNESCAP. We are very pleased to have the 13th Global Forum on Human Settlements here in Bangkok. The forum was held around the world, including during Rio+20 United Nations Conference on Sustainable Development in 2012, in New York, and a month after the adaptation of the 2030 Agenda for Sustainable Development, as well as during Habitat III in Quito in 2016. Now you are all gathered here in Bangkok. The theme of this particular Forum “Advancing Urban Innovations to Achieve SDG 11 and the New Urban Agenda” is very appropriate this time. While different themes have been discussed, the issue of the New Urban Agenda, new innovations in cities, I think, is the agenda that we need to discuss to address the SDGs. 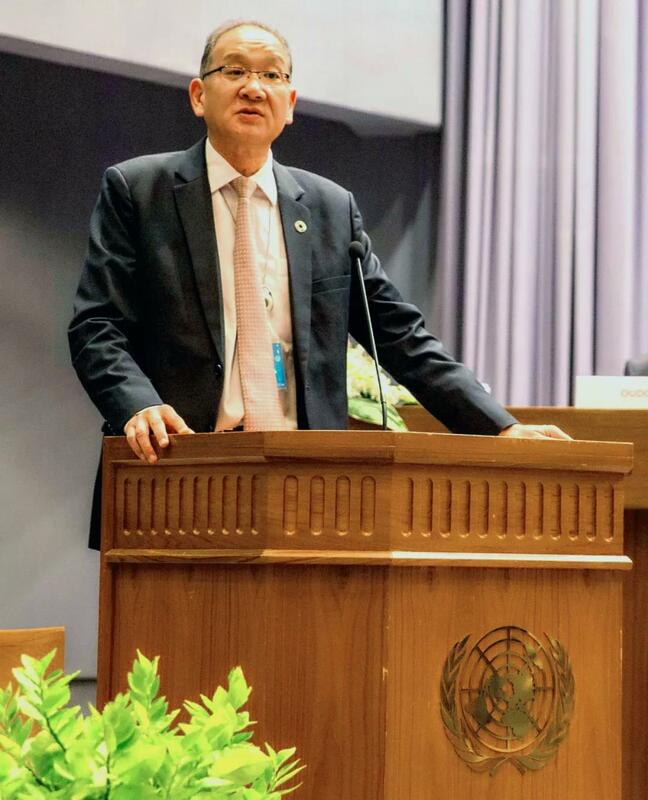 I want to thank GFHS 2018 for organizing the Global Forum on Human Settlements at ESCAP with the cooperation of the Global One Belt One Road Association, the Universal Peace Federation, the World Association of Non-Governmental Organizations and the Better City Institute. Senior officials from the United Nations, high level officials from Thailand and from other national governments are joining us here today in a meeting between city mayors, practitioners, private sectors, and civil society representatives. We are all gathered here more than 350 of us from all sectors, all over society to discuss the New Urban Agenda. As you know, cities in Asia and the Pacific have been the engine of growth for the past decades. Cities have been the economic force driving national economic growth, whether it's Seoul, where I am from, or Bangkok, Manila, New Delhi, or numerous other cities throughout our region. While they have been the engine of economic growth, they need to address the issues of the social and environmental consequences of rapid economic growth. By being the very engines of growth in our region, it has been a magnet of attraction for other people. Rural-urban migration has been high. People are moving into cities. The bright light of cities is very attractive. The concentration of people in urban centers has led to a diffusion of social issues and environmental issues, not least of all is the creation of large urban slums. Water and sanitation issues continue to strain our cities, designed for much less, but now accommodating much, much more than what they have the capacity to do so. It put strains on city's infrastructure, least of all is the water and sanitation needs. Cities are taking water from sources including aquifers directly below, causing cities like Jakarta to sink. There have major waste water issues in cities throughout Asia-Pacific, where waste water untreated is dumped into the oceans. As the engines of growth, they have had industries and industries are again sending off untreated toxic materials directly into the environment. The amount of people in our city centers in Asia-Pacific has some of the largest mega cities of the world, twenty million plus is putting a major strain on infrastructure. As you have all witness just driving to Bangkok this morning, it takes a lot of time weaving through, lots of time spent in traffic. The issue of traffic congestion throughout Asia-Pacific is putting an economic drain on the cities and the growth potential. These urban issues continue to plague Asian cities in trying to adopt the 2030 Agenda for Sustainable Development. But it is achievable and you will see during the next two days numerous examples of methods to deal with these great challenges. Many cities in Asia and the Pacific are adopting innovations. They are taking on resource managements, better resource and natural resource management. Taking in on smart cities, intelligent cities, eco-friendly cities are being developed, and much more needs to be done. This requires the participation of all of us gathered here to address the major challenges of our cities, which is a challenge that is addressing half the population of the Asia-Pacific region. By incorporating circular economy approaches, by reutilizing our resources better and minimizing our waste, by reduce, reuse, and recycle, are fundamental ways that we can deal with the disease that our cities are infected with, which is overpopulation and far too much waste being produced. I hope all of you are gathered here today for the next two days to deliberate on these issues, and to see how innovation, new technologies can be applied in the urban setting, in the cities of Asia-Pacific. Take from the best practice examples, try to accommodate in the local context, and see how cities can lead in the Agenda to achieve the 2030 Sustainable Development Goals. I wish you well in your deliberations over the next two days. Thank you.